I promote range and diversity. Thus, I recommend readers to expose themselves to as many different topics as possible. I usually have 2-4 books I refer back to at any given time. They range in topics from management, art, spirituality and philosophy. Trying to get the engineering thing going but don't much of a mind for science. I think that every career path begins with an understanding of who you are and what matters to you. In that light I will suggest some self discovery books. And of course some great business books. A non-business book that I always read at least once every few years is “The Alchemist” by Paulo Coelho. It’s truly helped me to become a better person mentally and spiritually. "The Alchemist” by Paulo Coelho is my all time favourite and followed by "Man in Search of Meaning” by Viktor Frankl. The Alchemist speaks of a fable, built on the metaphorical pillars representing life's challenges, particularly on a boy’s narrative of his journey of life. The story is fuelled with lessons of passion, trials of fear and uncertainties, courage, and in many aspects, illustrates the need of driving one’s capacity towards fulfilling their passion and calling. The transformational process of the protagonist brings upon parallel insights to my personal development, sometimes serving as a philosophical archetype. I especially dig the author’s term, ”warrior of the light”. This is stuck in my psyche, and I think that everyone can choose to become a “warrior of light” or learn to unlearn from being a “victim of darkness”. The Alchemist by Paulo Coelho because it is essentially a bible of life without having religious implications. There were multiple occasions that books I read helped me but what left a deeper impression was when a friend mentioned how a book I recommended changed his life. The book was The Alchemist by Paulo Coelho and that revelation was special because I realised a single idea has the power to change a person's trajectory. From that book, he started looking out for omens in his life and being more sensitive about the opportunities around him. He is now transitioning from being a corporate employee to an entrepreneur. I’ve read this book more than 3 times at different stages of life and in different languages (English and Chinese Mandarin). I love it, it’s remarkable! The Alchemist talks about "omens" or signs that appear in our lives that are meant to signal we are on the right path or to consider going in another direction. I read it on a sailboat in 4 hours in Boston, MA a few years ago. I couldn't put the book down. It gave me a new perspective on how to interact with life. Instead of trying to force things to happen or make things happen, pause, reflect, receive and wait. That everything is already and always in order if you are willing to pay attention and release attachment to your timeline. I have learned a lot of lessons that I often use to reflect today. The book is easy to read, which is an important plus for me as I’m quite busy. I know, it’s nothing compared to motivational speeches on TED Talk or inspiring stories of Steve Jobs. But at the time, it was the only thing that I clang onto to keep going. I believed that if I pour all my heart and soul into something that I love, I will meet success at the end of the day (I just don’t know exactly what “day” that will be haha). A lovely story about how the journey is often more important than the reward. Don’t stay in a job you hate just for the big bucks. 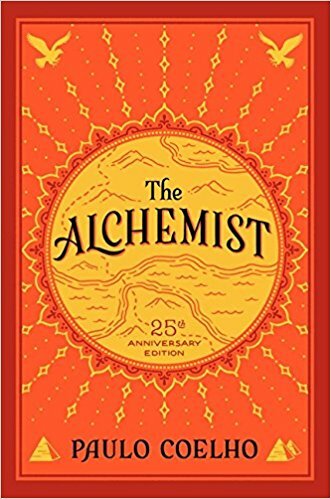 [One of the books that had the biggest impact on Roxana Bitoleanu] The Alchemist, because we shouldn't look for happiness further than ourselves. I see it as a spiritual guide, it helps me see things differently, with hindsight. What I like the most is that it reminds me that sometimes it’s better to listen to your heart rather than people telling you what you should do. And I think it’s really important, especially in this industry. A lot of people have something to say and advice to give, but in the end it’s different for everyone so it’s important to listen to your guts. I listen to it on my phone, the narrators are really awesome in the French version. It relaxes me and it’s my n°1 technique to get to sleep. It really opened my mind up in a way a book hadn’t done at that point in my life. It’s a beautiful, beautiful fable. I think everyone should read that book at some point in their life.